As the National Geographic Endeavour made its way around the Galapagos Islands, guests got the chance to see the long dormant Wolf Volcano erupt for the first time in 33 years. In line with Lindblad Expeditions’ philosophy of being flexible in order to maximise and heighten the travel experience of its guests, Expedition Leader, Cindy Manning, decided to adjust the day’s itinerary so guests could discover this once-in-a-lifetime occurrence. As can be seen in this candid video taken on board the National Geographic Endeavour, the Wolf Volcano - which is the highest point in the Galapagos at 1707 meters, put on quite a show for guests! 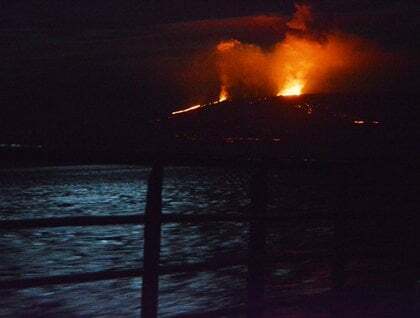 For two hours, the ship sat just under a kilometre from the Ecuadorian coastline of Isabela Island, were guests watched the foremost section of the basaltic lava reach the ocean and more billowing clouds rise to the sky. To add to the experience, Lindblad Expeditions’ crew set up wine tasting on the bow of the ship, so with a glass of bubbles in hand, a camera around their necks, and eyes wide open, they enjoyed an incredible volcanic show – an experience that they’ll never forget! Credit: Lindblad Expeditions, shot aboard National Geographic Endeavour.